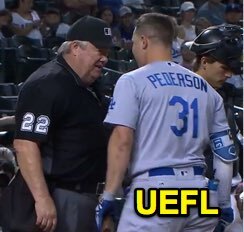 HP Umpire Joe West ejected Dodgers LF Joc Pederson (strike one and two calls; QOCY) in the top of the 9th inning of the Dodgers-Diamondbacks game. With none out and two on (R2, R3), Pederson took 1-0 and 1-1 fastballs from Diamondbacks pitcher Yoshihisa Hirano before striking out swinging on a subsequent pitch. Replays indicate the 1-0 pitch was located over the outer half of home plate and above the hollow of the knee (px -.621, pz 1.649 [sz_bot 1.565]) and the 1-1 pitch was located over inner half of home plate and thigh high (px .203, pz 2.088), the call was correct. At the time of the ejection, the Dodgers were leading, 6-3. The Dodgers ultimately won the contest, 7-4. This is Joe West (22)'s fifth ejection of 2018. Joe West now has 21 points in the UEFL Standings (17 Prev + 2 MLB + 2 Correct Call = 21). Crew Chief Joe West now has 2 points in Crew Division (1 Previous + 1 Correct Call = 2). This is the 175th ejection report of the 2018 MLB regular season. This is the 85th player ejection of 2018. Prior to ejection, Pederson was 0-2 (SO) in the contest. This is LA-NL's 8th ejection of 2018, T-1st in the NL West (LAD, SF 8; ARI, SD 7; COL 5). This is Joc Pederson's first ejection since April 6, 2017 (David Rackley; QOC = Y [Balls/Strikes]). This is Joe West's 5th ejection of 2018, 1st since Sept 22 (Rick Renteria; QOC = Y [Replay Review]).